Apple and pear shape obesity: Which is better? According to the pattern of fat distribution in the body, obesity is categorised into two types; apple-shaped obesity and pear-shaped obesity. The apple body shape results from deposition of fat in and around the abdomen. People with this type of body have big belly, and their waist circumference will be more than their hip circumference. This type of body shape is linked to greater health problems such as high blood pressure, diabetes, and coronary heart disease. 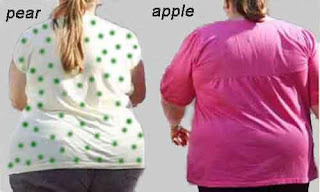 Apple shape body is more common in males. Researchers found that long-term stress is a major cause for this type of fat distribution. Too much stress raises cortisol level in the blood. The cortisol hormone facilitates the fat storage in your tummy. Apple shape body is linked to metabolic syndrome which is a combination of central obesity, insulin resistance, hypertension and high cholesterol levels. Genes also play some roles in the development of apple shaped body. People with pear shape body have their fat distributed in buttocks and thighs. Their waist circumference is less than their hip circumference. This type of fat distribution is more common in women. Pear shaped people do not seem to have higher risk of developing health problems like diabetes, heart disease, and stroke. However, with time, these people may store their fat above the hip. Then they will start to experience the adverse health effects of being overweight. People also like to read childhood obesity.